Private jet airports and private terminals at commercial hubs are the most comfortable, flexible, and secure way to arrive in Las Vegas, and our private jet service was created to deliver a personal, one-on-one consultative experience for corporate executives, executive assistants, and leisure flyers and high-rollers alike. 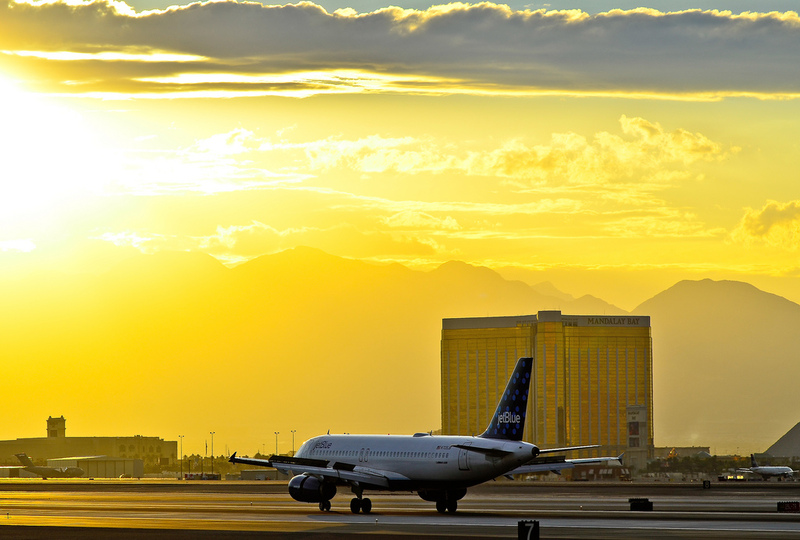 One of the world’s busiest airports, McCarran International (IATA: LAS, ICAO: KLAS, FAA LID: LAS) is the main gateway into Sin City, located just 5 miles south of the Strip, and it ranks 6th overall world-wide in terms of aircraft movements. After your private jet arrives at McCarran International, we can arrange to have luxury ground transportation to bring you to the resort or casino of your choice. We can also arrange helicopter lifts throughout the city. All four concrete runways at McCarran have been resurfaced recently, and with its shortest runway (1L/19R) being 8,988-feet long, the airport is capable of servicing private jets and airliners of all sizes. Signature Flight Support and Atlantic Aviation operate the two fixed base operators (FBOs), serving the needs of general aviation passengers outside the main concourse. (KLAS) McCarran International is also home to the Howard W. Cannon Aviation Museum, chronicling the early history of aviation in Southern Nevada. The museum is located on Level 2 of Terminal 1 above the baggage claim area. Renting a light jet or mid-size jet for your private flight? We can arrange for you to arrive at Henderson Executive Airport (IATA: HSH, ICAO: KHND, FAA LID: HND), a public airport located 13 miles south of the Strip. Clients interested in added anonymity can use (HND) Henderson Executive as their arrival or departure airport, skipping the high volume of ground/air traffic at McCarran. There are two asphalt runways: Runway 17R/35L measures 6,501 feet in length, and Runway 17L/35R is 5,001 feet long. Henderson Executive operates its own FBO. Referred to by Las Vegans simply as Northtown, North Las Vegas Airport (IATA: VGT, ICAO: KVGT, FAA LID: VGT) is Sin City’s second busiest airport, and the third busiest in the state of Nevada. It’s location of less than 6 miles northwest of the Vegas Strip make it the primary choice for general aviation in the area. Several helicopter operators are based at KVGT, including the L.V. Metropolitan Police Department and many scenic tour companies. The airport is also certificated under 14 CFR Part 139, serving as a base for local airsports. The airport operates its own FBO, offering full services to general aviation, crew, and passengers, making it an ideal alternative to McCarran International and Henderson Executive. If you’re planning on flying closer to the Lake Mead National Recreation Area, we can arrange for your flight to arrive/depart at Boulder City Municipal Airport (IATA: BLD, ICAO: KBVU, FAA LID: BVU, formerly 61B), a public use airport in Boulder City, Nevada, located around 30 minutes driving time from the strip. (KBVU) Boulder City Municipal features 3 asphalt runways to accommodate turbo-props, light jets and mid-size jets, and Boulder City Aviation Services (BCAS) and BFE operate the two FBOs. Have any questions regarding the Las Vegas private jet airports for your trip to Sin City? Call us at 1-888-987-5387 to speak with one of our brokers and discuss all of the options for your flight.